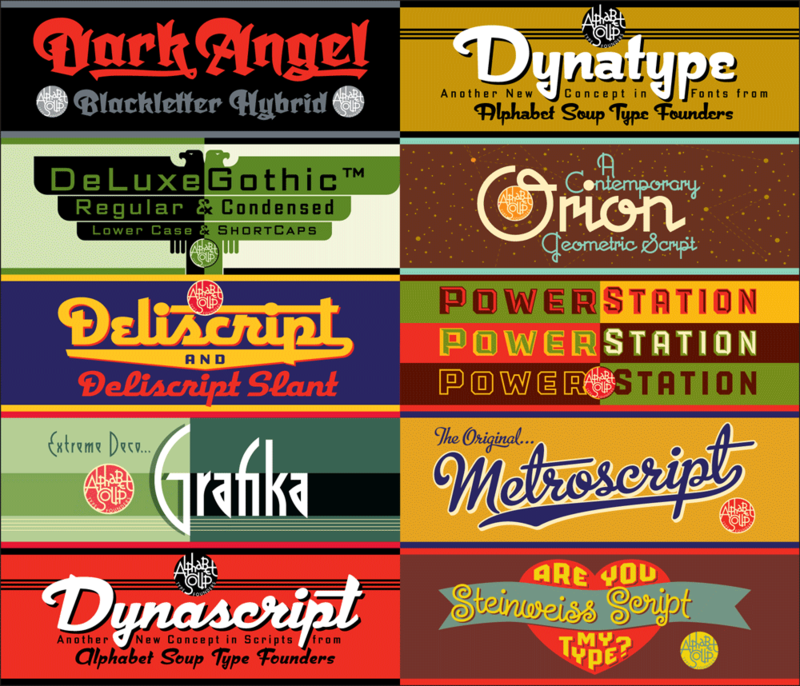 Many people have asked why I have only 10 fonts available for purchase. Part of the answer is that I’m sort of a perfectionist, and it takes me quite a long time to design, execute, and test a font to make sure it’s working properly. Also, all that work must be sandwiched in between design and lettering assignments—which must always take precedence. But there’s another reason why, at best, I can only turn out maybe one font design a year—and that is for me there’s a bit more to releasing a font than just having the font itself ready to go. There are a ton of supporting graphics that need to be created, and each font reseller has different requirements. But more importantly, I decided early on that included with each font I would supply a full color PDF Guide or Manual (all 10 represented above). From these multi-page PDFs one can get a very good idea of what these fonts look like in use, and gain an understanding their special features and how to access them. For example, the PowerStation Manual explains how to set layered copy in 2 or three colors, and in the Deliscript Manual you’ll find out how to access the special “t-crossbar” feature (among others). You’ll also learn some important “Do’s” and “Don’ts” for each font and (if you’re interested) read about how these fonts came to be. Originally these manuals were only intended to be included with the font download at purchase, but I realized that they should also be available for prospective buyers as well as others—they might help with a decision, or just serve as inspiration. I’ve put links for all 9 PDF downloads together on one page, together with several case studies of some of my design work. So feel free to go the DOWNLOAD page and click on 1, 2 or all 10 of them.